Tesla's Model 3 could disrupt plenty of sales going forward, given the flat-growth environment of the U.S. auto industry. Tesla (TSLA - Get Report) rivals take notice. While Tesla's second quarter wasn't all that impressive from a financial perspective, the story around Tesla is improving. It still chugged through more than $700 million in free cash flow burn and saw its cash position decline from $2.8 billion to $2.2 billion in just three months. However, the cash burn was better than analysts had expected and revenue grew more than 40% year over year. Plus, management is sticking to its outlook for GAAP profitability and positive free cash flow for its fiscal second half of 2018. That's largely being helped by the fact that Tesla plans to produce more than 50,000 Model 3 vehicles in the third quarter and likely more in the fourth. The fact that these are all high-end Model 3s should really help drive profitability. In any regard, if Tesla is pumping out 50,000 Model 3s this quarter all with a starting price of $49,000 or higher, that demand has to be coming at the expense of someone else, right? On the conference call, management shared with us which non-Tesla competing models are being turned in for the Model 3. They are the Toyota (TM - Get Report) Prius, BMW 3 Series, Honda (HMC - Get Report) Accord, Honda Civic and Nissan Leaf. While the base Model 3 will reportedly start at $35,000, it is not yet available. That means in many cases, consumers are stepping up to the Model 3. It's an upgrade, not just a car in a similar class. That may make it less of an apples-to-apples comparison, but should these automakers still worry? After all, if drivers are turning these cars in, they may very well forgo purchasing them in the future as they opt for the Model 3 anyway. That concern may grow too, now that Tesla is ratcheting up production so quickly. A little digging on the numbers suggests that perhaps other automakers should take note. For instance, in the first three months of the year, Honda sold 61,601 Accord models, an 11.7% decline from the 69,815 it sold in the first quarter of 2017. However, in April through July, the decline worsened, as sales fell 16.1% year over year from 121,179 units to 101,615. The decline is highlighted by the 19.3% year over year drop in July. Honda's other car, the Civic, actually had positive growth in both first- and second-quarter 2018. However, the April through July period suffered a 7.9% drop overall, thanks to the 28% decline in sales in July. The Prius is also suffering through a double-digit decline year over year, although the difference between first and second quarter is not as drastic as the Accord. Worth noting, though, is that the Prius family suffered through a down year in 2017, so the 2018 decline doesn't appear to be related to Tesla at the moment. On the electric car front, we have the Leaf, which had year over year growth almost every month in 2017. In March, April and May of 2018, it also had year over year growth. However, in June and July, sales actually declined 9.2% and 10.4%, respectively. That may suggest the increasing Model 3 production (despite a far higher price tag) is eating into sales. Given that annual U.S. auto sales have been hovering near 17 million units for several years now, it's clear that growth really isn't there. But at Tesla, growth isn't stalling, as there are hundreds of thousands of reservations still in place for the Model 3 alone. Admittedly, reservations are not the same as sales, but clearly there is demand for the young automaker's products. The question is how that will impact other cars going forward. Given that industry growth just isn't there, it seems very much like a zero-sum game. In other words, if someone opts for a Model 3, it comes at the expense of another vehicle sale. Be it a Mercedes C-Class, an Audi A4, a Chevy Bolt or a Ford (F - Get Report) Focus. 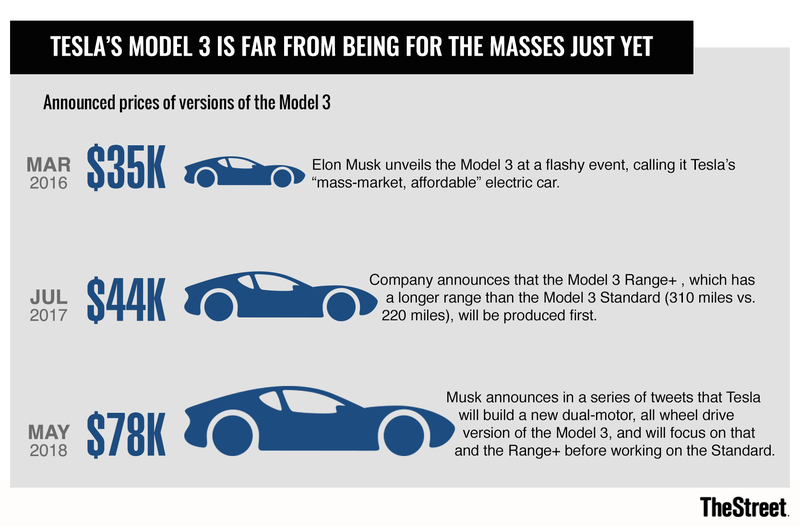 Either way, the Model 3 will have an impact. The question is, though, just who will it hurt the most? We'll figure out the answer over the next few months as production ramps up. Longer term, the question will evolve into how well Tesla can hold off its competition, like General Motors (GM - Get Report) , Mercedes and Porsche -- the last of which has a real beauty on the way.